. 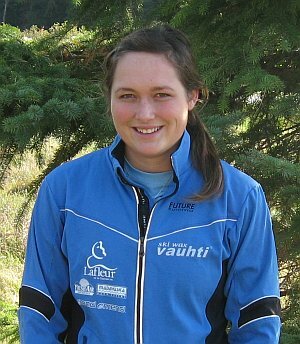 : Danielle McVicar :: Ski XCOttawa.ca :: Skiing in Ottawa and Gatineau Park :. Danielle comes to us all the way from Kanata! Then during the ski season she leaves us for the University of New Hampshire where she has an awesome scholarship. Her goals are to make NCAA’s and be top 15 in every collegiate carnival this year. The team noted this summer that US college races are called carnivals and we think they sound much more fun than just another race. Danielle is a great asset to the team particularly during summer training. Other Pursuits: Majoring in Economics with a Bachelor of Science from the University of New Hampshire.